Includes Pre-Printed Linen & All Embroidery Floss. This beautiful red-work Christmas wreath makes an excellent wall decoration when stretched around a 12in x 12in artist's canvas. Hidden within the wreath are many Christmas treasures such as gingerbread, candy canes, Christmas lights, teddy bears, angels, snow men and reindeers! 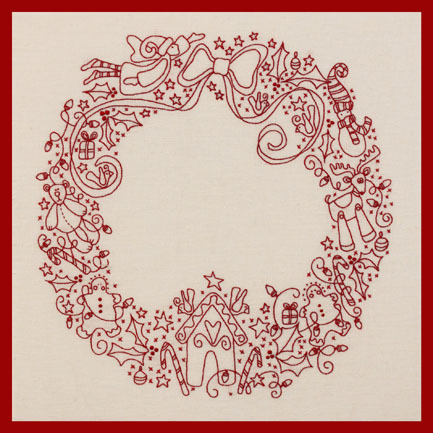 Enjoy the Christmas spirit as you stitch this lovely project.